As part of using Virtuous Giving, your donors will have access to a donor portal where they can log in, view their gifts, manage their stored payment methods, and even update recurring donations. 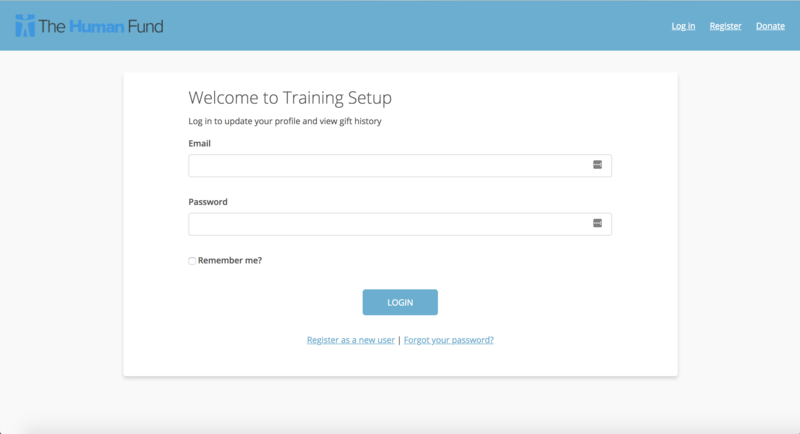 Configuring your donor portal is the final step in setting up your Virtuous Giving account. Once you have set up your merchant account, you'll be taken to the donor portal setup screen. For your subdomain, it best to choose a shortened version of your organization name, without spaces, all lowercase. 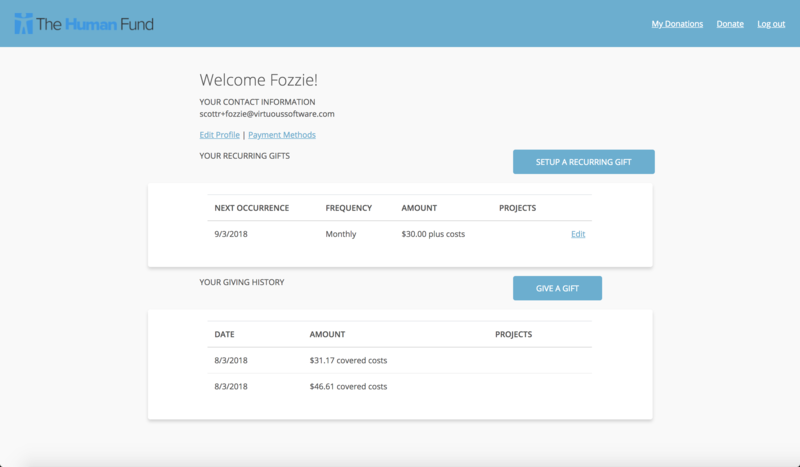 Then, you'll have the ability to customize the design theme of your donor portal, by customizing the color scheme, adding your logo, and the url for your organization's home page. You'll need to use hex codes to identify colors, and include a url for your logo. You should be able to obtain both from the resources used on your main weeb site. Finally, you will want to enter a specific sender name and sender email address for all automated emails sent via the donor portal, to make sure donors know they are coming from your organization. Once you have completed the portal configuration, you'll be taken to the main Virtuous Giving page, where you'll see a direct link to access your new donor portal site. If you'd like to make changes to the design, click on the Setup tab at the top of the screen to access the configuration page. Any changes made will be reflected on your live portal site within an hour. Once your site is ready, you can invite donors to login and claim their account. Once a user is registered, they may log in to their account at any time from the main donor portal screen. Each Virtuous Giving user account is tied to a specific email address, since email addresses are required for online processing. If a donor were to use two separate email addresses to make two separate online gifts, they would then have two separate Virtuous Giving account, each of which can be linked to the same Contact record in Virtuous. In this way, it's best to think of Virtuous Giving as a separate entity from Virtuous CRM, albeit one that is seamlessly connected to the CRM. Virtuous Giving accounts will be connected to Contact records in Virtuous as part of the Gift Import process. When a gift is matched to a Contact and then imported to that Contact record, a link, or reference, between the Virtuous Giving account and the selected Contact record in Virtuous. It's possible to see these connections when viewing a Contact record; just look for the small External References box in the lower left corner of the Contact Overview screen. If a gift made via a separate Virtuous Giving account is made, but matched to the same Contact record as the previous gift, then both Virtuous Giving accounts will be connected to the same Contact record in Virtuous CRM. This means that gift entry staff must be well trained, so that connections can be made correctly during Gift Processing. For donors who register on the donor portal, it is easy to make donations directly from their portal account, as their credit card information will already be stored. Users can click on the Donate link in the upper right menu, or click "Setup a Recurring Gift" or "Give a Gift" on the main home screen of their account to quickly make a new donation. 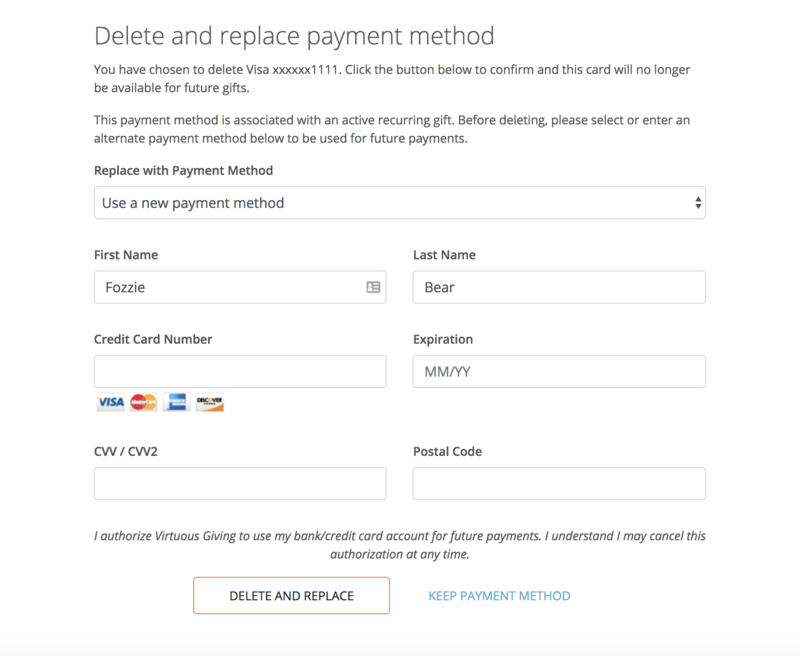 Users will also have the ability to click "edit" next to any active recurring gift in order to update the payment method used, or cancel their recurring gift. Clicking on "Payment Methods" from the main donor screen will allow users to manage their saved cards, add a new payment method, or delete any saved payment methods. If a user attempts to delete a payment method that is actively being used for a recurring gift, they will be prompted to select or enter an alternate payment method, in order to ensure their ongoing contribution schedule is not interrupted. It's critical to note that donors who wish to update the payment method being used for a recurring gift must make this change themselves via the portal; your staff will not have access to update stored payment method information. Should a donor call on the phone and wish to make a change, it's best to walk them through the process of setting up their account (if they have not already) and making the change.